Unit: British Museum. Destination: Babylon. In 1930, archaeologist Harry Reginald Holland Hall published a book on his wartime journey to Mesopotamia on behalf of the British Museum in 1918-19. Its lengthy descriptive title - A Season’s Work at Ur, Al-Ubaid, Abu Shahrain (Eridu) and Elsewhere: Being an Unofficial Account of the British Museum Archaeological Mission to Babylonia, 1919 - masks what an interesting read it is. 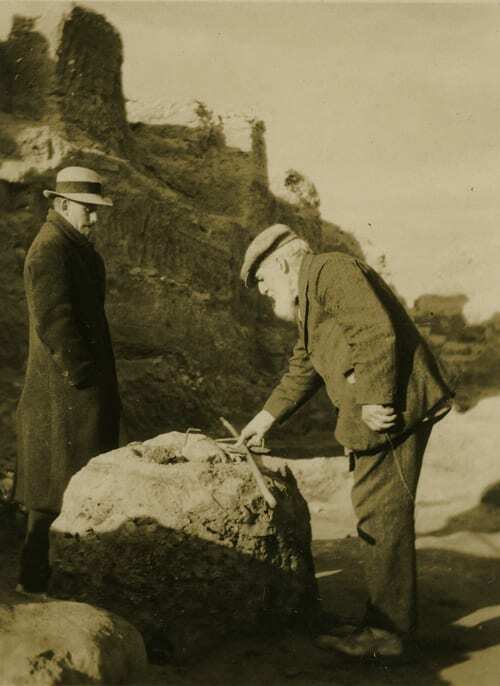 He’d packed up his trowel in a kit bag, to paraphrase that popular WW1 song, and gone to “Mespot” to check on its antiquities and conduct some preliminary excavations, in preparation for what he called a “new regime” of British administered archaeology in the region. He describes his rather complicated and quite fascinating journey to “Mespot”, involving several stops and changes en route, in great detail with characterful flair in the first chapter of his book. It begins at Waterloo Station, where he boarded a troop-train headed for the coast. On arrival at the northern French port of Cherbourg, he boarded another train, travelling through France and Italy, celebrating Armistice Day en route at Lyon. He caught a boat from Taranto, Italy to Port Said, and then went overland to Cairo to have an archaeological confab with fellow excavators David George Hogarth (in charge of the Arab Bureau intelligence network), Leonard Woolley (fresh from a prison camp), and James Edward Quibell (Curator of the Egyptian Museum). From Egypt he caught the British India Steamship Navigation Co’s Chakdarra, stopping in Bombay. Major-General Sir Walter Cayley, commanding the 13th (Western) Division in Mesopotamia, was also on board, and he asked Hall to deliver a series of archaeological lectures to the troops on board. This request is fascinating, as it indicates the provision of educational opportunities for soldiers serving on the Mesopotamian front during wartime, and an attempt satisfy troops' interest in the archaeological landscapes they were moving through. There is a 21st century equivalent to this history too. After the looting of the Baghdad museum in 2003 archaeologists created a bespoke set of ‘heritage’ playing cards to educate US soldiers serving in Iraq about antiquities and archaeological sites. Pictures of some of these cards were published in Public Archaeology journal in 2007. The 100th anniversary of World War 1 is still continuing, and with it associated digital history and exhibition projects. Although there is no equivalent for Mesopotamia that I know of (but do check out Paul Cooper's recent Twitter thread on his great-grandfather's archive), you can discover how WW1 soldiers captured their own experiences in Egypt and Palestine through the Views of an Antique Land project. I’ve also written a post on the Palestine Exploration Fund blog about a fascinating series of post-war letters from WW1 soldiers who had served in Palestine. You can read “To the Secretary, Palestine Exploration Fund” here. Hall, H. R. 1930. A Season’s Work at Ur… London: Methuen. Public Archaeology 2007. The Civilisation Cards: US Army Style. Public Archaeology 6 (4): 242-244. Woolley, L. (Ed.). 1920. From Kastamuni to Kedos Being a Record of Experiences of Prisoners of War in Turkey, 1916-1918. Oxford: Basil Blackwell. Last month I wrote about an unexpected find of some letters from ex-WW1 servicemen seeking employment on archaeological expeditions in Palestine. You can read "To the Secretary, Palestine Exploration Fund" here.